Hungarian architects Zsanett Benedek and Dániel Lakos of Tervhivatal have divided an office in Budapest in the loft of a former textile factory by building boxes. 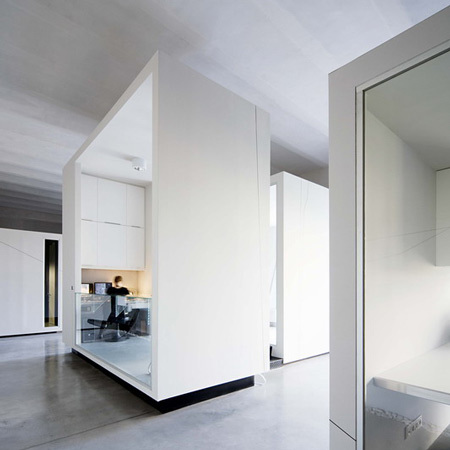 Called Goldberger, the project is divided into smaller offices and meeting rooms by these plaster-board boxes on steel frames, which are elevated slightly to denote corridors between them. One smaller box is suspended from the ceiling to form a hanging desk (below). Above: The hung table-box designed by Wanda Reich. The boxes are lit from beneath with LEDs and at night the space is used as a club venue. Captions are provided by the architects. Above: A hidden LED lighting is installed under the boxes. On the evenings the office changes to a club so the office is used for venue as well. Above: Reception box facing the entrance. Behind it is a small meeting room. Above: The large meeting room with the service counter in the background. Above: The bar with the service counter. Above: Spaces between the boxes functioning as hallways. Photographs are by Tamás Bujnovszky. Above: Some of the boxes are floating others are attached to the floor. Above: A narrow steel walkway between two boxes. Above: The external corridor of the building seen from inside the office. The plumbing and electric lines are covered with pebbles. Above: The interior of the manager’s room. The floor is covered with grey linoleum. Above: The counter-arched ceiling provides a contrast between the boxes. Above: The floor is made of polished concrete. Above: The logotype of the firm is a rotating box. Above: Steel frames of the boxes.